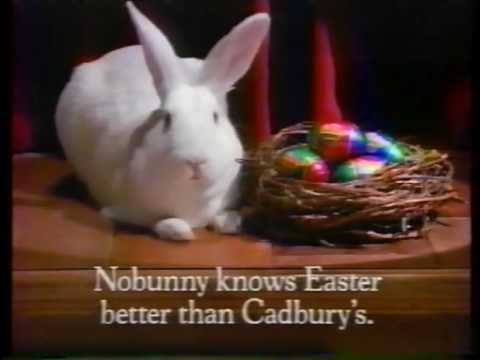 Sure, bunnies may be adorable and the bearer of the deliciousness that is the Cadbury Creme Egg, but don't write them off as harmless just yet. You see, I've got a theory. * These acts of sugary good will and cutesy-wootsey cuddley-wuddliness are all part of some elaborate public relations scheme spearheaded by a rabbit cabal to lull the masses into a false sense of security so that these long-eared rapscallions can raise hell and no one will be the wiser. Don't believe me? Well consider these delightfully fluffy pieces of evidence. *Yes. Yes I did make that reference within the very first paragraph of a post about bunnies. Would you expect anything less from me? 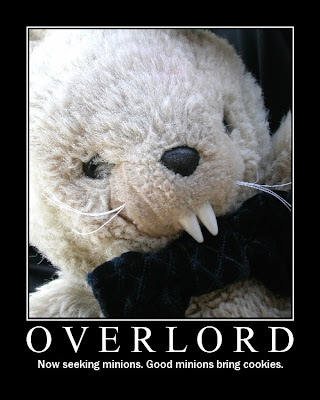 When asked about the identity of the fanged rabbit, his caretaker and confidant Jillian Venters of the Gothic Charm School answered, "[Clovis is my] fanged toy bunny, who is going to rule the world one day. Declare yourself a minion and show your loyalty, and he might spare you when he finally gets the mind control lasers running." Venters doesn't even attempt to sugar coat the truth, people. Bunnicula, ravager of carrots and whatever the tomato version of exsanguinator is, deprived an entire family of it's vegetable-based nutrition. The little monster's behavior was appaling. The real tragedy of the story, however, was the fate of poor Chester the cat. The whistle-blower was sentenced to kitty therapy for trying to save his humans by outing the little furry juicesucker. WARNING: This footage may be unsuitable for viewers with delicate sensibilities and those opposed to Monty Python skits. Blah blah blah actually a dead human blah blah blah committing crimes for the greater good. I DON'T BELIEVE YOU. 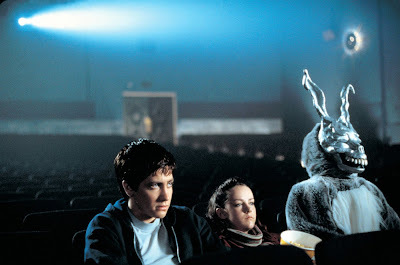 Did you ever consider Frank was actually a bunny wearing an elaborate man suit inside of a bunny suit and that he was forcing Donnie to do bad things in order to the save the universe only so that rabbits could continue on with their nefarious deeds? (I just blew your mind, right?) Yeah. Frank was eeeevil. Feared for over a millennia by men who cause heartbreak, the demon Anyanka was afraid of the tiny cotton-tailed scoundrels. She sang, "Bunnies aren't just cute like everybody supposes. They've got them hoppy legs and twitchy little noses. And what's with all the carrots? What do they need such good eyesight for anyway? Bunnies! Bunnies! It must be bunnies!" If a vengeance demon is afraid of the buck-toothed fuzzballs, you know they're bad news. 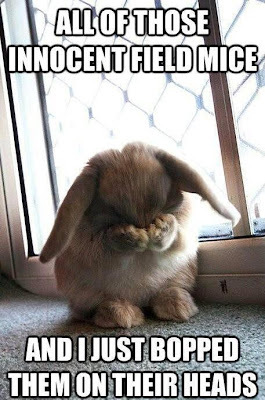 If you have yet to be swayed, this last entry will prove without a reason of a doubt that bunnies do bad, bad things. Meet Foo Foo, the little bunny who went on a three-day bopping spree terrorizing field mice throughout the Greater Enchanted Forest Area. The Good Fairy warned Foo Foo to end his reign of bopping but her threats went unheard. Under California's Three Strikes Law, Foo Foo received the mandatory sentence of being turned into a goon after defying the Good Fairy for the third time. Know of any other wicked rabbits? Please add them to the list in the comments below. Together we shall topple the rabbit cabal's stronghold! 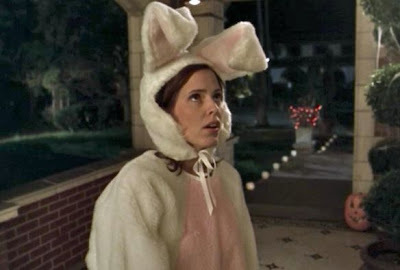 The main character in 50 Ways to Hex Your Lover by Linda Wisdom had killer bunny slippers with fangs and everything. I don't remember much about the book now, but I remember those slippers. You guys always make my day brighter (and make me snort with laughter)! The Trix bunny... always trying to steal cereal from little kids. Bugs bunny... always teasin everyone. Um hello, Bun Bun from Sluggy Freelance.